Before the busy Christmas trading period, Fraser Hart completely overhauled its Brent Cross store, which now represents a fresh new concept for the company. 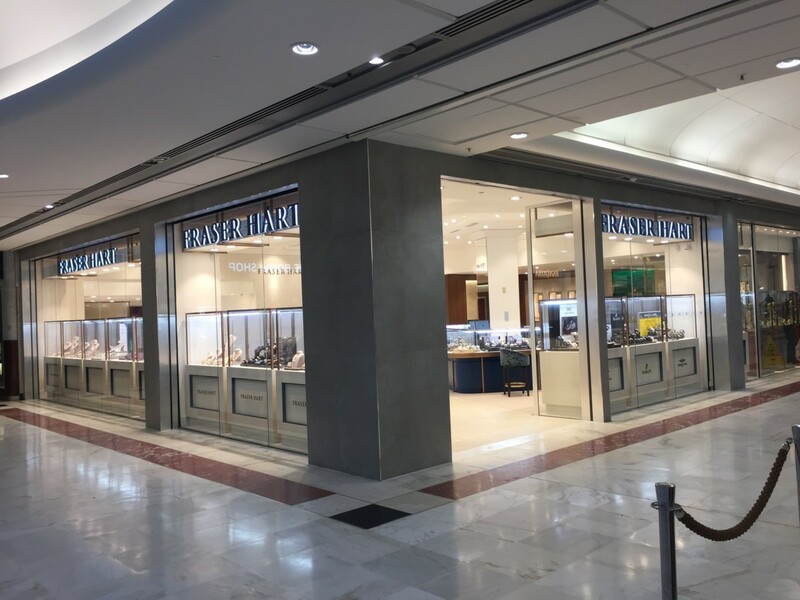 Placing diamonds in the spotlight, and making sure its jewellery offering complements the high-end watch brands, Fraser Hart has used the Brent Cross boutique as a test to see what changes need to be made to boost business across the UK. From a first glance, the store is brighter, and gives more space to jewellery than before. It’s also more modern, with cabinets taking inspiration from Jo Malone, yet it’s still instantly recognisable as a Fraser Hart boutique. New brands have been added to the mix – with the business tailoring its offering specifically to the Brent Cross clientele – and the store has three distinct spaces: a Rolex concession; a watch area; and a diamond room. Fraser Hart admits, like many jewellers in the UK, that it went through a period of watches dominating its stores, but now it’s going back to basics and balancing out its store products so that jewellery and watches work together to complement one another and in turn, enhance sales. 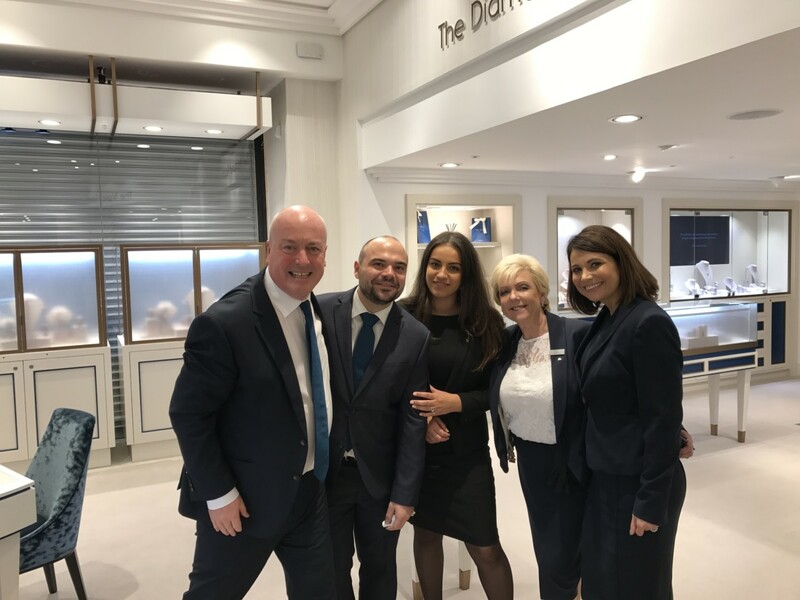 Although still in the early stages, and constantly being reviewed, the results so far have been remarkable, with the company’s jewellery sales in the Brent Cross boutique quadrupling over the last six months since the revamped store opened. Here, Professional Jeweller editor Stacey Hailes talks to Fraser Hart’s retail director, Richard Parsons, who joined the company a year ago, to discuss the new concept, plans to embrace omnichannel opportunities, and the retailer’s focus for the year ahead. PJ: How have you transformed the Brent Cross store to strike a better balance between watches and jewellery? RP: It is very easy with the watch brands to be almost driven by the fact that they are so powerfully impactful from a visual merchandising point of view, but actually our diamond offer is really important to us. So in Brent Cross what we decided to do is very clearly differentiate between a Rolex area, which is crucially important to us, to a lovely watch room that is like a bit of a man cage in the middle, and a very feminine diamond area. Personally, I think for the first time we have done it properly and we have invested in it, and we are getting the results from that. We were aware we needed to tip the balance back a little bit. To have a successful business that has the products that we have I think diamonds and jewellery are massively important. It enhances the luxury watch offer if we’ve got a jewellery range that complements it. We’ve probably focused a little bit more on watches in the past, but we’ve put a lot of effort into getting the balance back and using it all to complement each other. This is what we are going to do moving forward, try and give all our products a more equal space. We’ve also introduced some diamond shop-in-shops, which we have never done before, but we wanted to reinforce how important our diamond offering is. PJ: What has the reaction been from customers so far? RP: Because it is almost our prototype, we have a review of this shop every month to see whether or not we can make anything better, and we’ve got a review meeting this afternoon to see what we can tweak next. So we opened in September 2017, and it’s been really good so far and very promising. It sounds like a made up number but we have probably quadrupled our sales on jewellery because it is so predominant in the shop now. We are absolutely delighted with that. We didn’t think that we would do that, but we have. The Rolex window has also worked incredibly well, and then on the side window we have majored more on jewellery and we have bought in some brands that we didn’t have until Brent Cross, such as Carat* London, Swarovski, and Eclat. We also have Northern Stars, our own mine-to-finger diamond collection, and then Chopard, Marco Bicego and Chimento are new brands for us. We had a very instant reaction to Carat*, Swarovski and Eclat, so we have already rolled them to a few more stores, but the luxury brands are more exclusive and they are not for everywhere. This is such a different offer to our usual offer so you can see where the extra money is coming from really. All of this is trying to make sure we are balancing the incredibly strong watch offer with our own jewellery. One of the others things that we know we’ve improved on is we’ve increased our average review score by 60% over the last six months, and I think nearly every one of our competitors either stayed the same or declined, so we are very proud of the fact that in a market that is quite discerning we are prizing ourselves ahead a little bit, which is a small positive, but we are taking it because we are just starting to move the bar a little bit. People only review if the service is great or awful, so you’ve got to delight people to get the review. 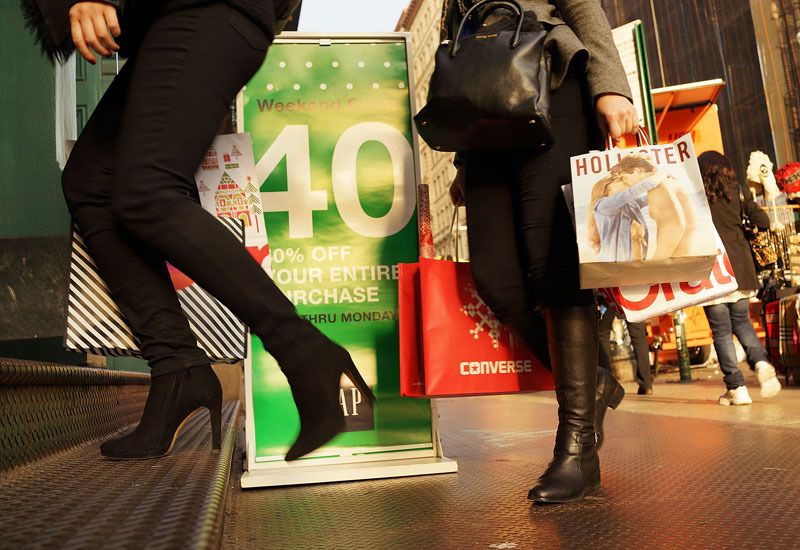 PJ: Retail at the moment is challenging, what are you doing as a business to combat challenges on the high street? RP: I am really pleased to say we are still growing like-for-like. I’ve just come back from a retail conference and everybody put their hands up to say it was the toughest conditions ever, but we are still getting some growth, although small, we are pleased with that. Obviously in Brent Cross we have done something quite different and that’s working, but we’ve got another group of stores we’ve now got to go back and work on now we think we’ve got a winning formula. I think one of the things we did before we did anything here was to listen to our customers about what they think of us, and to some degree it was quite hard to hear, there was a bit of feedback around ‘where are they?’, because they didn’t know one multiple from the next. So we needed to differentiate ourselves, and in Brent Cross we have tried to look different to our competitors and be a bit more clear on who our customer is and putting the right products in the store. We are just trying to make sure our people have the tools and the skills to be able to match the store environment with the experience we are giving to our customers. The Brent Cross store feature three distinctive areas. PJ: Staff retention is key during difficult trading conditions, as the company’s retail director, what do you do to engage staff? RP: We’ve learnt our lesson that we lose people we haven’t necessarily recruited well, or we haven’t done a good enough job of inducting them into the business. When we do a good job we keep them for a long time, and we have good longevity within Fraser Hart, and we’ve got good service levels. I think our average service is 16 years. You still lose people but we work very hard to keep the people we want to keep, and we have a very good commission scheme that we have just changed to be more team related, so rather than paying commission on individual sales we are paying on the team achieving its targets, and we like that philosophy. Rather than the risk of our people feeling like car salesmen, we want them to feel like they are doing it for the good of the team and when the team hits everyone wins. When the market is tough you’ve got to create a philosophy and then stick to it, and we are very much about team, and Fraser Hart is effectively a family business, it is still privately-owned and we try and retain that kind of feel within the business because that’s our best USP. PJ: How do you empower your store managers to take ownership of their particular branch and tailor the customer experience to the area? RP: One thing that we introduced in the last year is that every manager has their own P&L, so they’ve got profit and loss accountability, which they didn’t have, and didn’t have visibility of before, but now everybody knows their business numbers. I think to ask somebody to take ownership and not share that information is really difficult. So we have now given them the info they would need to take ownership. Obviously there are still people who are learning about that because it’s a big ask to get everybody to get it, but some people have really grasped a hold of that and taken a genuine ownership of their business. Our next step is going to be involving them a bit more in some tailored range work like we’ve done in Brent Cross. We really need the managers to help tell us who their customers are and what they are asking for so we can tailor the product offering. I think that can be a real edge for us. We’ve only got 40 shops in the UK so it isn’t that difficult to locally range 40 shops and we are well on for the planning for that, and I think that could be a really good USP to use for the remainder of this year, because actually I don’t think anyone else can react as fast as we can. We also try to treat our managers like grown-ups and have as much transparency about the business as we possibly can. PJ: As Fraser Hart’s retail director, what’s your focus for 2018? RP: For me, it’s a bit of a ‘back to basics’ message really. So how we have been talking about local ranging, well you would have thought we had done that as a business like Fraser Hart, but we hadn’t, so we are doing it now. In retail we can all get a bit carried away in the good times, but we are having to fight for every penny right now, and I think to some degree we have forgotten how to do that. So we’ve come up with the Fraser Hart ‘Perfect 10’, and we have said to everybody — let’s all agree these ten things and let’s make sure we are doing them every day, and if we are we stand a good chance of doing ok and taking some money, and hopefully we will all get that reward if sales come through. So it’s all been about back to basics. The basics are the bits that we can control. We can’t control Brexit and we can’t control the economy, we can just do what we can to get it right in store. Furniture in the diamond room takes inspriation from Jo Malone. PJ: Can you share what kind of points are in the Fraser Hart ‘Perfect 10’? RP: Things like, are we going out to the window to talk to people? In a jewellery environment a lot of our customers start of as browsers who are just having a look, now I would say you need to go out there and talk to those people and see if they need any help. See what they are interested in, see if we can even help them in the town that we are in. It’s about making a human connection. And then when you bring them in, make sure they get offered a drink — just those basic principles. Again, when things are easy you don’t have to do any of them, so actually one of the things we are doing and we are getting right in a few places, is just getting those basics right. All the 10 points are all as basic as that. Are we listening properly to what people are telling us about what they are actually looking for? Or do we just have on our mind what we want to sell them? So we are just tuning in a bit more and trying to encourage our guys to be a bit more human and not be sales people. As a family business, we don’t have some of the private equity pressures, and therefore we’ve got where we are by being nice. We are a business full of really nice people who aren’t always hugely commercial, so let’s use that to our advantage because people tend to trust us quite well. It’s really hard to stop people who think they’ve got to be a really hot sales assistant to suddenly be just a human being, but we will make customers for life by doing that. PJ: What other areas will Fraser Hart be focusing on this year? RP: We know we’ve got an opportunity with digital. One of the messages that is really loud and clear is you can’t talk about an online and store business anymore, it’s just one business. And I think we are working hard at the moment to integrate it all together so that we don’t talk about the web as separate, we just talk about the business. That is such a cultural shift for all of us, but that’s what we’ve got to do to crack it. One of our real opportunities is we haven’t cracked the web yet. What is so exciting about this business is I am not sat here saying we’ve done as much as we can on the web, we know we haven’t, so we’ve got it all to come. It’s worth fighting for. Online is our untapped opportunity. Everybody else has optimised already, and we know we haven’t, so we’ve got a really big chunk of business still to come as we become more competitive so we are really excited for the opportunity. PJ: How does Fraser Hart create a memorable experience for its customers? RP: Probably what I just said about what I am so proud of is this heritage where we’ve got managers who have been here for 40-odd years and lots of other staff members who have been here for a really long time, and actually when they talk about the Fraser Hart of old, they talk about this business that was full of love, and people who loved working here, and I think they still do, but it’s about how to we get back to that? And we’ve called it ‘Fraser Hartness’. How do we get back to the Fraser Hartness, and make people really proud to be part of this business? Our customer experience is all about allowing people to be themselves and not feeling really pressurised to sell. That’s our best hope of changing the customer experience. We can do lots of things physically in store, but if our people aren’t special, we may as well not bother.